Gender falls on a spectrum. Gender identity is not as simple as the polarized social view of male vs. female and most humans fall somewhere on the spectrum in between. Individuals who seek professional care when identifying within the genderqueer experience report desiring: “competency, comfort and experience” from their mental health care provider. 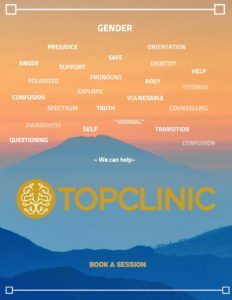 At TOP Clinic we prioritize each individual’s unique sense of self with non-judgemental, accepting support. You can request an initial consultation by using our booking form.